In case a pelican snatched your phone, some pretty big stuff happened on Friday afternoon. ESPN’s Adrian Wojnarowski reported that Danny Ferry was removing himself from the Pels’ GM interview process, and only minutes later, broke the news that New Orleans will be hiring David Griffin to be the Executive VP of Basketball Operations. Make no mistake – this is a monumental moment for the New Orleans Pelicans franchise. Forget the basketball reasons for a bit. Obviously, Gayle Benson (and every NBA owner, for that matter) should want to hire someone savvy enough to make the franchise’s most important decisions, and Griffin certainly qualifies as someone who can be trusted in such a role. You’ll be able to read about his resume and accomplishments to date elsewhere. I’m focused on all of the other reasons why hiring David Griffin matters. 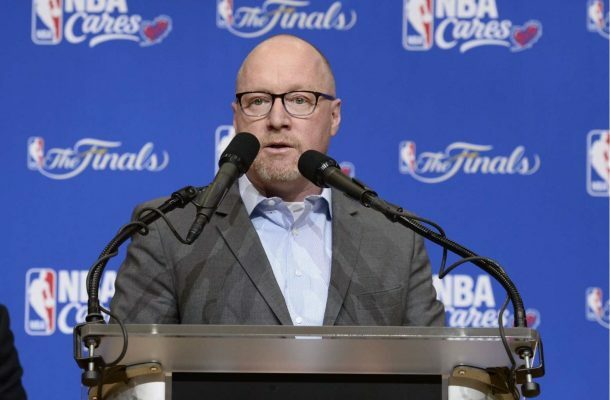 I’ve talked to some league sources, who confirmed David Griffin received assurances the Pelicans are making a larger investment into their front office under his leadership, so expect to see added staff and more layers, including a bolstered scouting department. Such a commitment is essentially table stakes to get a guy like Griffin to run the team. Why would any high profile candidate agree to take the job otherwise? It would be like trying to play a video game on a controller with a broken button. Sure, you can probably still play, but if everyone else who you’re playing against (okay, fine, I see you, Lakers – almost everyone else) has fully functioning controllers, you’re starting at a disadvantage that you willingly accepted by choosing to play, so you can’t really use the broken button as an excuse for losing. Certain people would rather play with a broken button than not play at all, but those probably aren’t the type of people with whom you want to place your bets. In any case, the mere fact that the Pelicans have shown a level of commitment in this area worthy of Griffin’s approval is at minimum an improvement, and at most a major shift from days past. But it takes more than an investment in the team’s long-term success to land a candidate like Griffin. It’s not as if he hasn’t had opportunities before and wouldn’t have others in the future. If Griffin is signing on to take over your team, he better actually be taking over. For example, just two summers ago, he turned down the Knicks’ GM job. According to Woj, “the Knicks and Griffin were at odds over Griffin not having full authority on basketball decisions and over Griffin’s preference to bring in his own staff… In his next job, Griffin is searching for autonomy in the front office and an ability to build a working partnership with the owner.” Back in 2010, Griffin passed on the Nuggets’ GM job, both because of salary as well as an uncertain level of authority. With this hire, the Pelicans’ ownership group is essentially handing over full authority to Griffin and his eventual basketball operations team. For a franchise that has been perceived by many as “football executives running a basketball team”, the hire signals a massive shift. Which brings me to my next point regarding external perceptions of the franchise. The most knowledgeable Pelicans fans understand that, while there are elements of truth in how the team’s structure has been viewed historically, there is a lot of noise out there. That being said, it often does not matter what’s true and what is not if it’s what people believe (just ask the US president). Forget all of that now. There is no longer any confusion about whether or not this is a football operation that also happens to also own a basketball team. Because, to be quite honest, Griffin wouldn’t sign up for that. If he got the sense that he and his would be treated like a second class citizen in comparison to his NFL peers, he would have walked right out the door. This is a basketball ownership group that is determined to see its NBA franchise succeed. That ownership group, of course, is led by Gayle Benson, as it has been for the past year since her husband Tom’s death. Despite senseless detractors fueling baseless negative beliefs about her ability to run the Pelicans’ franchise, she continues to say and do all of the right things (more on this in a second), even if it’s not easy. For example, it would have been simple to just take the interim title off of Ferry’s position and make him the Pelicans’ GM moving forward. Not just simple, but it would have been a totally acceptable thing to do. In a vacuum, Danny Ferry would be a totally reasonable candidate for a GM opening – he is very smart and has plenty of experience making tough decisions. But that wasn’t going to cut it for Gayle. She recognized the need for change, and took action, hiring arguably the best possible candidate by taking all of the steps outlined above to show how serious she is about this team. After the Pelicans fired Dell Demps, Gayle told us exactly how she planned on structuring the team moving forward, and yesterday’s announcement proves that she meant what she said. If there’s one thing that Gayle has done better than her late husband, it’s communicating openly and transparently with the fan base. Historically, the Pelicans have been an incredibly tight-lipped organization, for better or for worse. In hiring Griffin, Gayle has brought on a leader who places a similar emphasis on communication. While it’s too early to tell how much of this will translate to the content and frequency of messaging to the fan base, there is reason to hope that Griffin’s hire signals a philosophical change in how the Pelicans approach their relationship with those who support them. While this topic isn’t necessarily as foundational to the team’s chances for success on the court, any action taken to further build the fan base is one that shouldn’t go unnoticed. And with that, we enter into a new era of New Orleans Pelicans basketball. Mrs. B ain’t messing around, y’all. Anthony Davis or no Anthony Davis, I could not be more excited. Let’s ride. AWESOMENESS! Gayle Benson is AMAZING!